From that magical land on the opposite side of the mitten from where I am sitting called Grand Rapids comes Brewery Vivant. 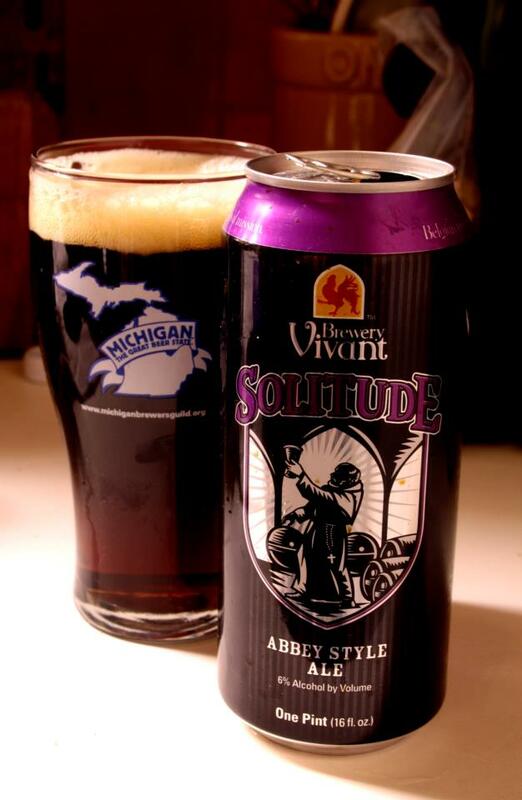 Unlike a many of Michigan's top notch breweries that are very high hopped driven-Vivant prides itself being much more Belgo-centric and paying tribute to some brews that have been around since the first crusades. Their use of yeasts from Belgian Abbey breweries give their beers a traditional base of flavor without excess spices. Then good ol' American microbrewing experimentation follows. The beer pours chestnut with some ruby highlights from a 16 ounce can. Head is off tan in color. Fluffy and strong that melts into some spotty lacing. The aroma is understated at first but as it breaths nutmeg, green apples, vanilla and raisins. Plum is the initial thing that pops into my mind upfront. Very earthly and tart. White tea and pepper make and appearance in the middle. Interesting counter balance between the sweet and the savory. Things wrap up with a mix of grapes, toffee and a hint of baker's chocolate. A slight tang linger in the mouth for just a right time for the finish. Because it is on the average age of the alcohol content (6% abv) and a fresh sweet and sour flavor this beer has I can see it becoming one I might grab for after being out working in the yard, heading to the beach or going with whatever may be cooking over the wood fire.